This year I'll be participating in the 12th Annual Maine Cancer Foundation Tri for a Cure. Maine Cancer Foundation is committed to reducing cancer incidence and mortality rates in Maine, with 100% of funds raised by the Foundation used to benefit the people of Maine. 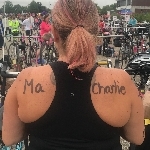 This is going to be my 5th year participating in the Tri for a Cure and will surely be the most difficult for me as the one person that motivated me to do my first race and was always at the finish line for me lost her battle this year. I know that she is going to be with me every step of the way and I will push harder knowing we are fighting for a cure. This year I am going to be participating in honor and memory of 3 amazing people who have lost their battle with cancer. Karen "Ma" Sinclair - Ma fought for a long courageous battle for 6 years. She lost her battle with Non Small Cell Adenocarcinoma (NSCLC) on 1/16/2019. She was a warrior in every sense of the word. I am so honored to have had her as like a mother to me for majority of my life. She touched so many lives before her journey began, during the journey and many more that will come after. She was simply beautiful on the inside and out. Although in the end she didn't beat the cancer, I know she tried with every bit of her soul to make it until her very last breathe, so to me she did win. He daughter is one of my most cherished friends and together we are going to fight in her honor and continue to try to raise awareness. Uncle Charlie Croxford - My uncle Charlie had a short but strong battle with cancer. He lost his battle with Bladder Cancer on 8/24/2018. He was one of the funniest men you could ever cross paths with. In fact, when I am emotional during this race I will hear him in my head saying "what the hell are you crying for." He was so damn proud of me for doing the Tri and he would always give me one of my first donations or at least say he was going to but not before he told everyone else to donate to me! Last summer during the Tri he was really sick but still made sure that he told me how proud he was and that he was going to beat cancer so that we could participate in a race together. Unfortunately, that day will never come but he will carry me to the finish line each and every year. Prentice (Junior) Yarborough- I never had the honor to meet Junior, however his daughter Amy, my cousin, is one of the most loving people I have ever met. Junior lost his battle with Anaplastic Thyroid Carcinoma on 7/5/2004. I wanted to include him this year as my cousins, Ben and Amy, who I love tremendously have both lost their fathers to this terrible disease. Watching those you love grieve is one of the worst and most helpless feelings. Please consider donating and if you pray please pray for these families. The Main Cancer Foundation leads a state-wide effort to advance the most promising and effective cancer-fighting efforts available through a combination of grant-based financial support and coalition building. MCF's Challenge Cancer 2020 initiative is working to reduce cancer incidence and mortality in Maine 20% by 2020 through prevention, screening and early detection, and access to the highest quality care for every Mainer.